"It Will Be Quite Ugly" As Fed Ignores Looming $4 Trillion "Big Policy Mistake"
Last week we reported that after some $34 billion in Treasury and MBS maturities on October 31, the Fed's balance sheet had shrunk the most ever in one month since the start of the Fed's quantitative tightening, as the Fed's holdings of Treasurys, MBS and other assets declined to "just" $4.14 trillion, down 7% from their all time highs of $4.5 trillion one year ago. And it is this decline that is now spooking Wall Street, with a Bloomberg report citing Fixed-income traders who are "telling the Federal Reserve that it might end up making a big policy mistake." While most pundits have been concerned about the Fed ongoing rate hikes and resulting tightening in financial conditions, as the Fed's balance sheet unwind has picked up, "unexpected knock-on effects" have emerged in overnight lending markets such as IOER, Fed Funds and, of course LIBOR -which just hit a new decade high - where demand for short-term cash has been on the rise again after a sharp spike earlier in the year. The argument is that the Fed's balance sheet shrinkage is increasingly threatening financial stability, resulting in quotes such as this one from TD Securities rates strategist Priya Misra: "The Fed is in denial. If the Fed continues to let its balance-sheet runoff continue, then reserves will begin to become scarce." They will become even more scarce if the Fed continues unwinding its balance sheet at the current "cruise control" speed of $50BN per month. If the Fed maintains the current pace through the end of next year, its assets would fall to about $3.7 trillion from $4.1 trillion today (and a high of $4.5 trillion), resulting in even more distortions in overnight funding markets. 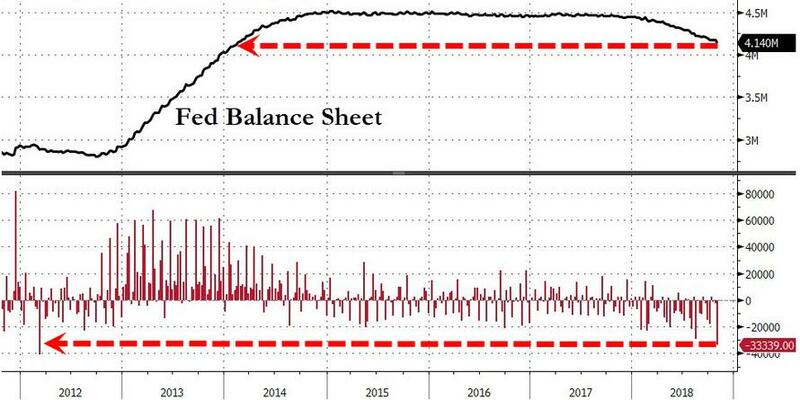 Which, taken on its face, is bizarre: while the Fed's excess reserves with banks currently amount to just over $1.7 trillion, this number was just $50 billion, give or take, before the crisis. So, as Bloomberg wirtes, it’s curious to think that at current balance-sheet levels, "the U.S. banking system could be facing a problem of not having enough cash." post-crisis rules enacted to curb risk-taking, like Dodd-Frank and Basel III, have prompted banks to use much of those same reserves -- upwards of $2 trillion worth -- to meet the more stringent requirements. It’s those forces that are, in effect, creating the scarcity of reserves that has banks -- mainly the smaller ones at this point -- scrambling for short-term dollar funding. Since the Fed started shrinking its assets, reserves have fallen by more than a half-trillion dollars, according to Fed data from Barclays. "The current backdrop is one that is dominated by the regulatory landscape,” said Jonathan Cohn, the head of interest-rate trading strategy at Credit Suisse. He estimates excess high-quality liquid assets (which include reserves) at the eight U.S. globally systemically important banks have fallen by more than 15 percent since the Fed began its unwind. “Banks are in a decent position right now, but over time this will begin to weigh” on them. One place where this argument can be seen in real time is the market for fed funds, where a rising level of stress has been observed in the past year, and specifically the IOER, or interest on excess reserves rate, which together with the Fed's Reverse Repo Rate on the bottom, defines the corridor in which the Fed Funds rate is expected to move. The issue is that since the start of 2018, the Fed Funds rate has drifted ever higher to the top of this range and is effectively on top of the IOER. In response, in June, the Fed tweaked IOER so that it is now slightly below the upper target. (Before, IOER and the upper band were the one and the same.) The change emerged after domestic banks doubled their share of daily demand for fed funds in the second quarter from the start of the year, according to Bank of America. And, as noted above, since the start of the Fed's QT, "the effective rate has started to creep higher. Last month, it even bumped up against IOER for the first time since 2009 and the rates have been in line with one another almost every day for the past couple of weeks." While some have linked the drift to the Fed's balance sheet unwind and resulting reserve scarcity, the Fed disagrees. That said, there has been a slight shift in Potter's language in recent months, stating in August that he sees “no evidence that we are at, or close to” reserve scarcity, and a few weeks later that he “[doesn’t] believe we’ve reached” that point. Whether this implicitly suggests we’re now potentially close to a kink point in the demand curve for reserves is undoubtedly a core uncertainty for Treasury markets. 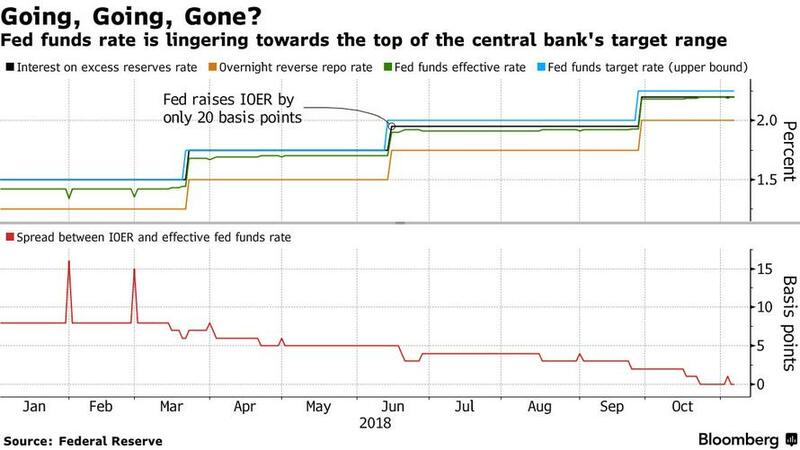 It is also why analysts predict another tweak to IOER either this month or next, which is when traders project the Fed will raise its target rate even as many increasingly expect the Fed to soon stop shrinking its balance sheet. TD’s Misra estimates it will by December 2019, though she wouldn’t be surprised if the runoff ended sooner. We’re increasingly hearing chatter that the Fed’s balance sheet runoff could end as early as next year – a risk the market isn’t focused on at this stage. In the event that such a shift is the function of funding stresses in the very front end of the market as reserves are drained, it would be accompanied by increased conviction on the part of the Fed to hike rates – effectively the last tightening tool. Meanwhile, as the Fed refuses to address what to many bond traders has become the potential catalyst for a "$4 trillion policy mistake", Michael Cloherty, head of U.S. rate strategy at RBC Capital Markets, is worried. He says the biggest risk is the Fed turns a blind eye to the pressures on bank reserves and triggers huge swings in short-term rates with its balance-sheet runoff. “At some point, all of the reserves outstanding will be locked up by all the people who need it” to meet all the regulatory mandates, which may lead to a “scramble” for short-term cash, Cloherty said. "If the Fed keeps shrinking its balance sheet until it sees signs of stress, the question will be, "How ugly is that stress?’ I think it will be quite ugly." Perhaps he is right, but the bigger question is how did regulators get things so wrong that some $1.7 trillion more in bank reserves than existed before the financial crisis is now grounds for concerns about a potential liquidity scramble, and the next logical question: how long before the Fed is forced to think not only about ending quantitative tightening, but launch the next round of quantitative easing?